Leave it to a pile of pretty red leaves to coax me out of my blogging hiatus. Curiosity doesn’t rest. Not in this house. I’ve made this salad before. 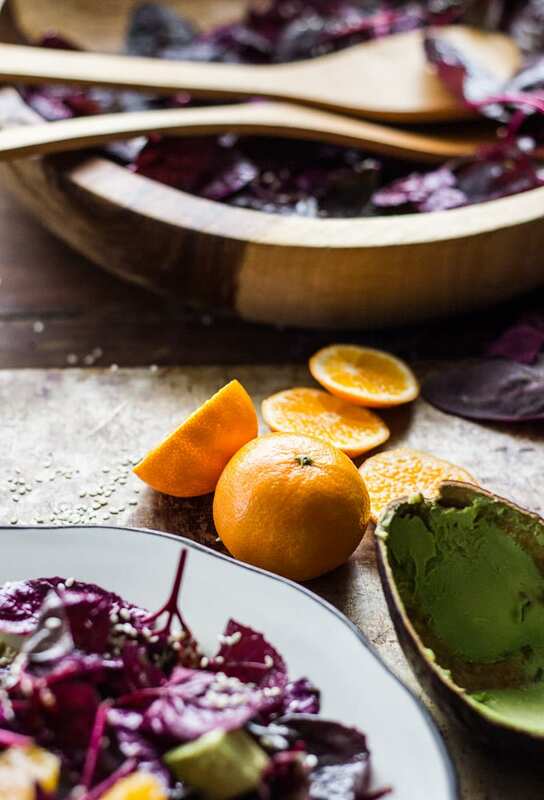 Chunks of avocado and clementines are tossed with tender green leaves and drizzled with a salty-sweet vinaigrette. A sprinkle of sesame seeds blankets the top for a subtle texture on the finish. It’s delicious. I can have that any day. What is it about heirloom produce that’s so utterly fascinating? This beautiful spinach comes from a wild seed cultivated in Europe. It grows in clusters and gets its signature red color from natural sunlight. The leaves are soft like velvet. I wanted to rub them all over my face! This spinach is mild in flavor and should be prepared with care. A gift from the gods. Ever feel the magic of the farmers’ market? The locals set up their stalls and tempt us with their beautiful offerings; colorful displays of heirloom produce we’ve never seen before. A sea of excitement. Will there be Snowflake Potatoes this week? Moon & Stars Watermelon? Purple cauliflower? The farm-to-table movement is nothing new. People want variety. They want to support their local farmer. And considering the majority of our food is genetically modified and doesn’t taste right (hello, tomatoes) wouldn’t you want to eat the real thing? The food industry is corrupt. And, I shall refrain from divulging additional details on the subject as you might fall hostage to my so called ‘passionate’ views. So, here’s the bottom line: the big wigs control the market and want to keep it that way. The little guys can’t compete. They grow what they can. Save their seeds. Sell on a small scale. Because you can’t have Christmas every day. Only dress the salad right before serving. The leaves are very delicate. Use leftover vinaigrette for this crunchy, Chinese chicken cabbage salad. *Only dress the salad right before serving. The leaves are very delicate. To make the vinaigrette, add the first 7 ingredients to a small bowl. Whisk well to combine. Slowly add the the olive oil to emulsify. Add the spinach leaves to a large salad bowl. Peel the clementines and discard the skin. Using a pairing knife, carefully slice away the outer white pith. Cut the clementines into bite-sized chunks. Peel and pit the avocado. Chop into chunks. 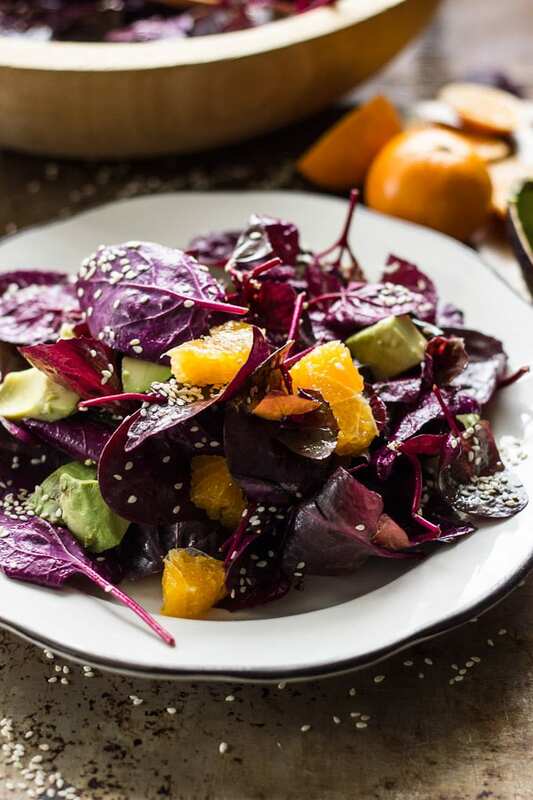 Add the oranges, avocado and sprinkle with sesame seeds. Toss with vinaigrette to coat. This is such a stunning salad! Pinned! So pretty! I’ve bought some of that gorgeous spinach this winter too. 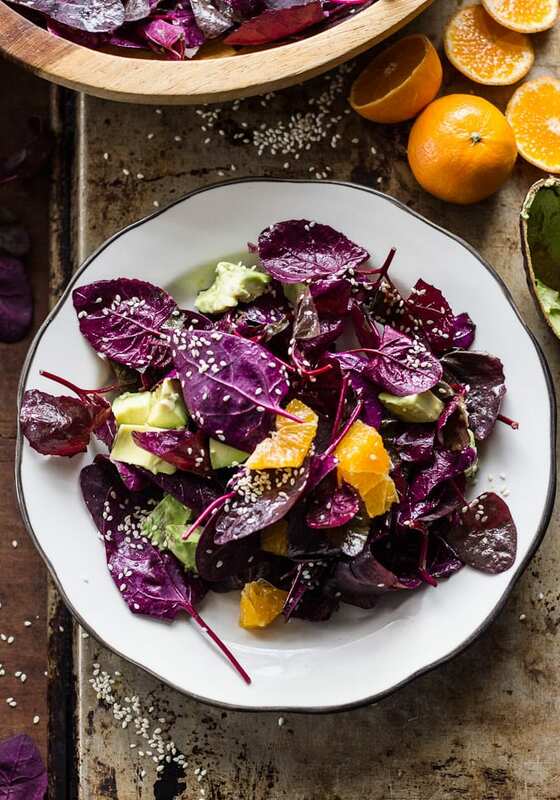 It’s a stunner and this salad is perfection! That spinach is absolutely beautiful! Am definitely pinning! Something tells me that we could spend hours chatting over coffee if we ever met in person! The food industry and all of the issues that go along with it is something that I am very passionate (and… opinionated) about ;) but I wholeheartedly believe that it’s important to be informed. Anyways, my favourite mornings at the farmer’s market are the ones where I discover something new and special. This heirloom red spinach is so pretty! I’ll keep an eye out for it! Love this! I have a total weakness for heirloom produce and it’s all of it…the taste, the colours, the stories. I’ve never seen this beautiful purple spinach before. Would love to get my hands on some seeds. Beautiful salad and pictures! Welcome Sofia! Thank you! We share the same weakness. Heirlooms should be treasured for reasons beyond eating. Although I wouldn’t mind living on heirloom tomatoes for the rest of my life! How beautiful. Leave it to you to make healthy food look fabulous. I think I would like some of this right now. I hope all is well, and I wish you a happy, healthy, and prosperous 2015! got any room on the soapbox for me? I’m right up there with you in terms of the food industry and their controlling what we can eat. Where in the world did you find such lovely heirloom spinach this time of year? Yes sista! Step on up! With regards to the food industry- if even half the amount of stuff we hear is true, we are totally screwed. The least I could do was to post something like this, showcasing the glory of heirloom produce and its significance. Finding red spinach was like spotting a leopard! What a treat! And believe it or not, I bought it at Trader Joe’s. Do you have one near you? oh i expect that at least half of it is true. and that is the stuff we hear about who knows how much has yet to be uncovered. yes “screwed” about covers it. i do have a trader joe’s that is relatively close to me so the next time i’m in that are i will be sure to look for it. Thanks for the tip. Wow what a beautiful salad! And I have never seen that gorgeous red spinach before but will for sure be on the hunt for it. Yes, the food industry is very corrupt – so much to talk about! Happy New Year! Thank you Laney! I’m trading in my greens for reds. 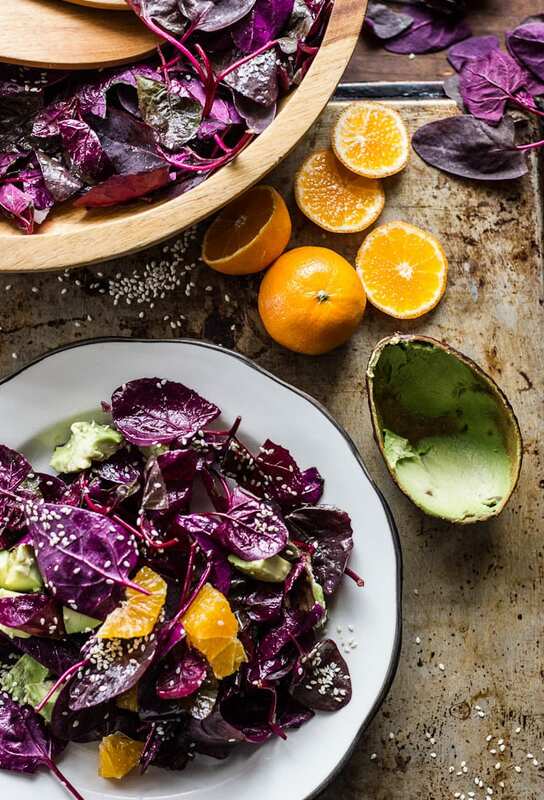 It’s certainly a colorful way to enjoy salads. Love heirloom produce. We stumbled upon a great site a while back: diggers.com.au They have a huge range of heirloom seeds and plants that are now filling up our backyard. I wonder if you have something similar where you are. Nicola, what a fantastic website. I had fun poking around looking at the different seeds. How on earth did you decide! We do have similar sites here in the US, but it’s nice to see a global connection with regards to preserving heirlooms in general. Because really, they’ll go extinct if we don’t. I know the choice is endless! We’ve got a few different types of tomatoes growing, heirloom lettuces with beautiful red & green leaves, rocket, beetroot, spinach, ridged zucchini’s, butternut pumpkins, and our aubergines are just starting to flower. My favourite though is the multicoloured corn. So beautiful. Glad you liked the site. ain’t nothing like the real thing! real food. always. I’m not sure I’ve ever seen different colors of spinach before. It’s absolutely stunning and the flavors in here are just perfect. So wish we had local avocado. The only thing that makes me want to move to a warmer climate. This burst of color is exactly what I needed to see today! It is a bone-chilling zero degrees outside and snowing. I love the red heirloom spinach, when I can find it. In fact, I am looking into growing some, since reading this post. In other big news, I got a microplane for Christmas!!! I bought some ginger and citrus fruits for the sole purpose of making zests! It is dangerously sharp, I learned. And about your “passionate views”, I am right there with you. I was just reading about the recent studies that show how glyphosate is tied to both breast cancer rates and autism. It really disgusts me. It just makes me ever so grateful for a garden, for the opportunity to support local, organic farms, and for the option to purchase and save heirloom seeds. Posts like this power the movement and spread the word. XO, Emilie! The horrors of the food industry are indescribable. I first became aware back in college, almost 15 years ago, and I was utterly disgusted. And then compelled to learn more (hence the lengthy paper). I just don’t understand how we can get away with HALF the stuff we put/do to our food. The longterm effects are unknown. But recent studies, like the one you mentioned above, shows that it IS a serious problem. Hello! At least the rest of the world labels their GMO food so the consumer has a choice. Here, it’s just assumed that the majority is GMO and if it’s labeled otherwise, lucky you. 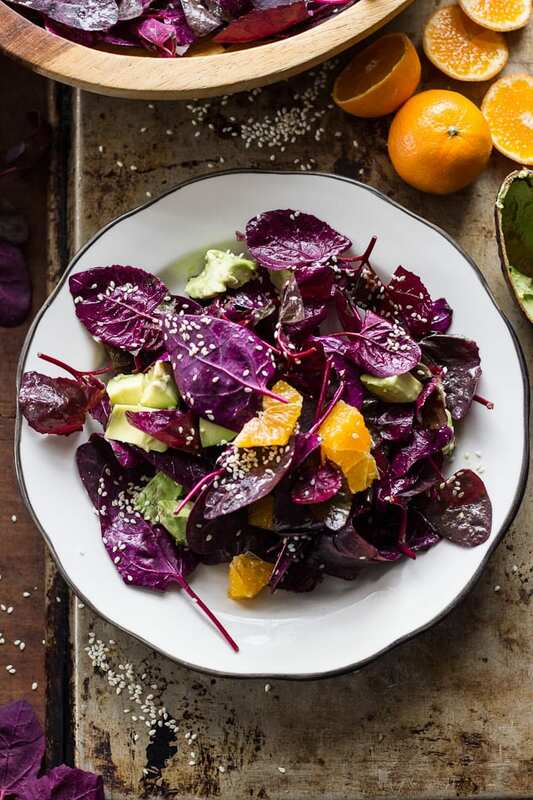 The red spinach is so striking, what a beautiful salad! It was fun to make too! The color is so amazing. The color of the spinach reminds me of red amaranth leaves. So striking, beautiful, pure and a welcome relief in the cold of winter. Our markets have closed for the winter, but I’ll keep my eyes peeled for this spinach at the Co-Op. What gorgeous contrasting color. I’d love to read your thesis. I am continually beside myself with the news coming out regarding our food supply (it seems to exponentially get worse). How is is that while other countries ban this and that, the US continues to welcome this and that with open arms? And although there is an abundance of information available regarding the ills of our food system, so many are still in the dark. I know I just read the same piece Jayme read. We must support local farms and protect heirloom stock. We must make it a priority. Our markets are closed as well, but guess who carries this? Trader Joe’s! Do you have one by you? That’s why I love that store. They’re known to hook up with some great local growers. Can you imagine that my thesis is almost 15 years old? I typed it on one of those big clunky computers and I’m pretty sure it was saved to a hard disk (remember those?). I have no clue where it is. But even back then I was astounded at the horrors of the food industry. Luckily I come from a great family, and was taught the importance of good food and to respect the land. What a gorgeous salad, Emilie! The beauty of fresh and preferably local produce is unique. Thank you Sini! I have to say, it was fun preparing as it was to eat. I was mesmerized by the colors. Wow, this is a beautiful salad! This is what I need to liven up a cold, winter’s day. That spinach is a stunner. Kristie, you have no idea. The pictures barely do it justice. If you ever see some of this spinach in the market- grab it! This looks so fresh and different. What a find…red spinach! !